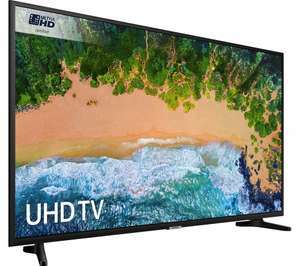 The Samsung UE50NU7020 50" Smart 4K Ultra HD HDR LED TV earned its Ultra HD certification. With a 4K screen, there's a huge amount of pixels working to craft lifelike images. Colours are accurately recreated onscreen thanks to HDR10+, which creates such lifelike images you'll be pulled into the scene. The UHD Dimming adjusts the brightness for different sections of the screen, so you can have dimly lit night scenes and shining sci-fi without ever losing the details to shadows or glare. A stylish addition to any living room, the Samsung 50NU7020 50" Smart 4K Ultra HD HDR LED TV is designed to look good from every angle. The bezel has been pulled back, so you get less TV and more screen. The back is clean and smooth, with artful grooves to guide cables out of sight. There'll be no unruly mess to distract from the entertainment. Looks like a great TV! But £379 at Richer Sounds with 5 year warranty! Hasn't the previous deal expired? clicking on the previous deal link takes me to ebay.co.uk/itm…196 £379. Hasn't the previous deal expired?clicking on the previous deal link takes …Hasn't the previous deal expired?clicking on the previous deal link takes me to https://www.ebay.co.uk/itm/253984157196 £379. The older deal might have expired fast if went out of stock quickly. Very good tv for consoles! Posted 43" verssion on black Friday. Great TV for 4k gaming with my gtx 1070. Also the convenience of having a store to return it to is more attractive to some? What are the main differences between the 7020 and 7400 ranges? Just bought the 7400b50" online this week for£354. 7020 was £314. Check out previous thread. 7400 excellent, BTW. Just bought the 7400b50" online this week for£354. 7020 was £314. Check o …Just bought the 7400b50" online this week for£354. 7020 was £314. Check out previous thread. 7400 excellent, BTW. Posted 43" verssion on black Friday. Great TV for 4k gaming with my gtx …Posted 43" verssion on black Friday. Great TV for 4k gaming with my gtx 1070. Hi, don't have the link but bought from cramptonandmoore eBay site on Wednesday £354 incl. Delivery, they delivered next day without additional charge. BNIB . would recommend. Already have a 55" 7500 model, which cost me about £850 under 2 years ago. This TV equally as good. Low response time around 15ms or one frame. Similar to other 60hz monitors around 12ms. Some old tvs can be 30 40ms so 2 to 3 frames. Of course I get flamed by people playing on 120fps or 144fps monitors. But for 60fps this is great and you can have a large display with 4k textures and all the apps that a tv brings over a monitor. Any cashback to be had? Somebody else just mentioned that to me today. Might opt for a Samsung …Somebody else just mentioned that to me today. Might opt for a Samsung then this time. Tbh I've not been very impressed with the picture quality on a previous 4k LG TV I ownedAny cashback to be had? I initially went for lg as was cheaper and low response time. But I belueve the samsung is better display. Particularly for me as use it for pc usage. This website rates things by usgae type so if it is just for coronation street upscaled that is different! There should be a rtings video review …There should be a rtings video review somewherehttps://www.rtings.com/tv/reviews/lg/uk6300I initially went for lg as was cheaper and low response time. But I belueve the samsung is better display. Particularly for me as use it for pc usage. This website rates things by usgae type so if it is just for coronation street upscaled that is different! Be careful when buying one of the Samsung TVs as I have had nothing but problems and cannot connect my ps3 to my series 7 uhd one. No matter how much I try, the suggestions, new hdmi leads etc, it will not be picked up by the TV. Works fine on the other TVs in the house, and the ps4 works fine, so it is most definitely a Samsung issue. Heat for TV as it's a cracking price, but just remember that it may not connect to a ps3.